I got into punk rock around 1981 which means I missed out on a lot of the first generation of United States punk rock as many of the bands from that first wave didn’t stick around very long but they certainly left a long-lasting impression that is still being felt today. People can clamor all they want about how it all started in New York and how the Ramones influenced everyone in the country when they toured and that would usually be true but to me the best punk rock back in those days came from the west coast, specifically California. That giant-sized state with its two major cities is responsible for more great punk rock bands than anyplace else on the planet and a little label called Dangerhouse Records put a lot of it down on tape and released it to the world. The label put out only 14 7″ singles, one LP and one compilation 12″ EP in the few years that the label was in existence but to this day the label stands as the single greatest punk label of all time. Their output is now legendary and they had an amazing roster of bands and really the label’s output is totally flawless which is why people pay so much money for original copies of the label’s releases today. 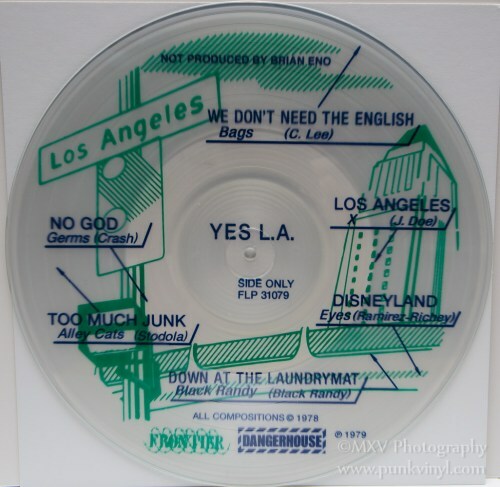 My posthumous point of entry to the Dangerhouse catalog was their compilation titled Yes L.A. This was a one-sided clear vinyl record that had silkscreen art on the non-playable side. My initial interest in that record was that it featured The Germs on it and they are my favorite punk rock band of all time. When I finally found a copy of this record that I secured from someone through a trade sometime in the middle of the 1980s I felt like I hit the record jackpot. This record was not an easy one to track down back then, long before there was an internet where for the right price you can find anything so when I finally got one it blew my teenage mind. That mind was further blown when I played the rest of the record which turned me on to these great old bands I’d never heard of before like The Eyes, Black Randy, The Bags and the Alleycats. In fact the only other band on here that I was familiar with was X and at that time my angsty teenage self didn’t like the band which my older self still can’t wrap his head around the concept since the band is actually brilliant. Anyway this compilation opened up a whole new world for me and set me on a mission that would take years to complete and that was to collect the entire Dangerhouse Records catalog, variations and all. 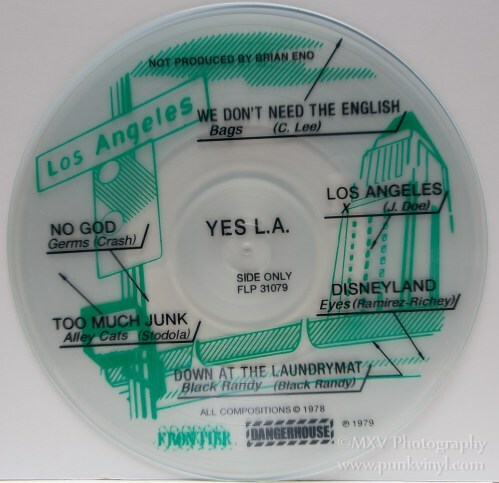 This was a lot harder to do in the pre-internet and pre-eBay age but it was also a hell of a lot cheaper than such a thing would cost these days.This included tracking down two more copies of Yes L.A. because there were three variations of that record which was in the form of different colored inks used in the artwork. 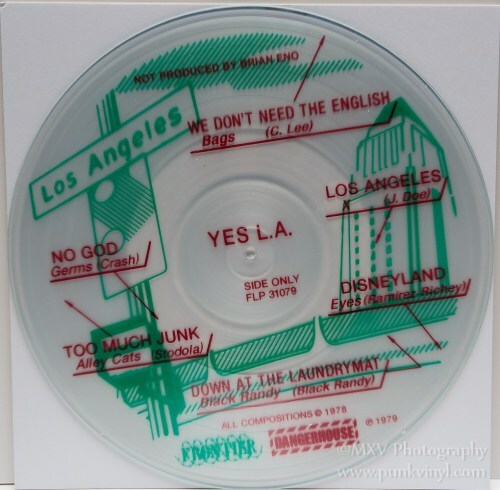 Because of how old Yes L.A. is and how the label who issued it ceased operations by 1980 it was rather unlikely that anyone would ever give the thing a proper vinyl reissue and if they did, who would be crazy enough to go through the time and expense to recreate the artwork, press up a bunch of clear vinyl, one-sided records and then hand silk-screen them all? Believe it or not there is actually an answer to that question and it isn’t “no one” but it is instead Frontier Records. 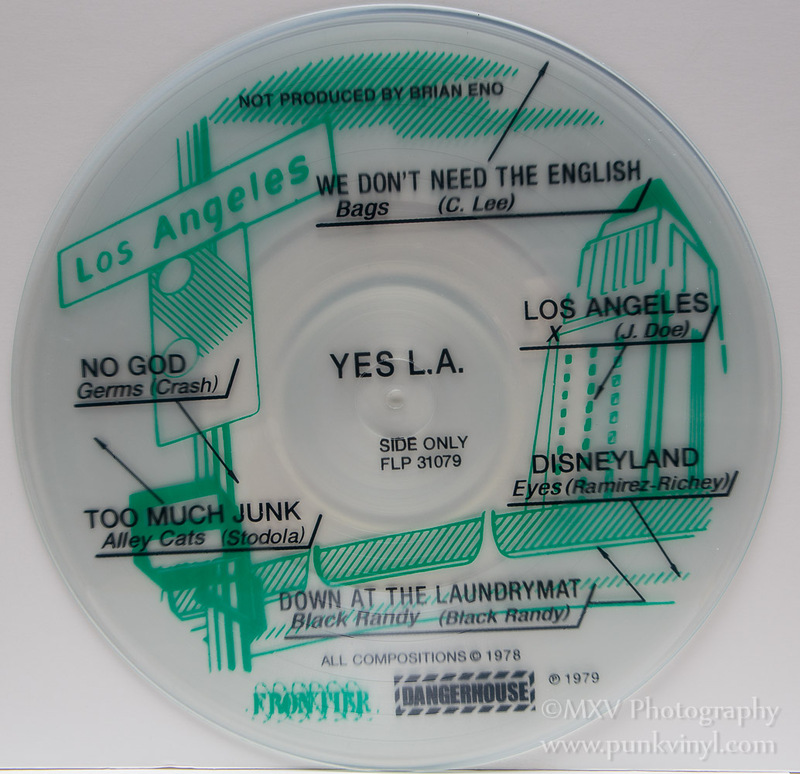 The label acquired the rights to the entire Dangerhouse Records catalog sometime in the 1990’s but aside from the two excellent but incomplete collection LP’s, neither most of the singles and Yes L.A. was ever reissued in their entirety, let alone on vinyl. 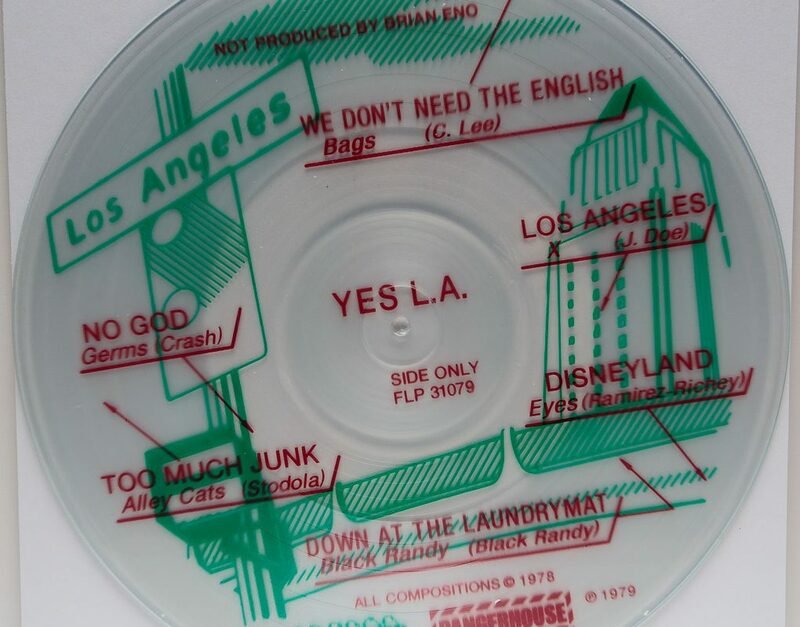 That all changed now as not only is there a box set of all the Dangerhouse singles (a feature on that is forthcoming) but Yes L.A. has been reissued on vinyl in its original form and it looks almost exactly like the original version did with just some minor differences. Frontier went through a lot of trouble and spared no expense (in both time and money) to recreate this piece of art to look just like it did back in 1979. Not only does it sound and look just like it used to but it is package the same too! They recreated this thing right down to the little foil sticker used to seal the plastic bag these come in. The cardboard backing is the same, the bag is the same, the ink colors are the same and so is the little foil seal. 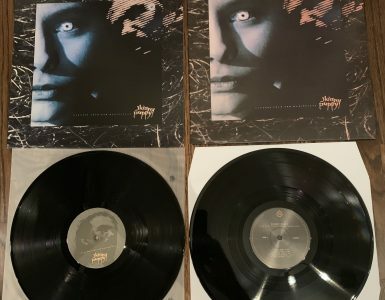 The only things that are different are adding the Frontier Records logo, the darker printing which makes the artwork easier to see through the grooves, and the catalog number being a Frontier one instead of the original Dangerhouse one. This reissue is a limited edition, one-time pressing of 1000 copies. It is broken into the same three variations that the original pressing was where the Text color ink either comes in red, blue, or black. 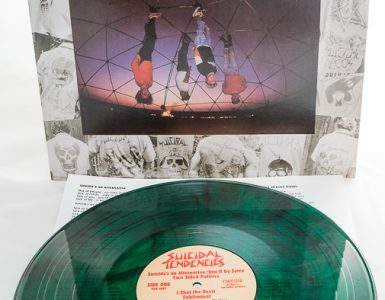 While the record may seem a little pricey keep in mind that these were hand-made, the entire thing took over a year to do, and it will set you back only about a third of what buying an original one-off of eBay would set you back. 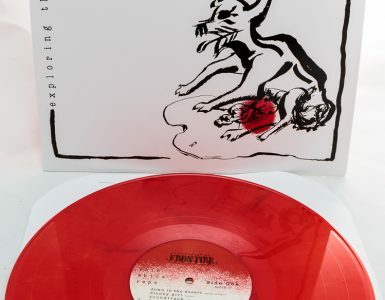 Head over to the Frontier Records website if you want to get one while they last, which isn’t likely to be very long!